Background/Info: We welcome the fourth volume of the “Tomb”-series created by Cryo Chamber this time dealing about ordeals. 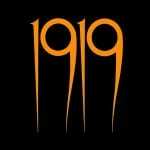 Eight bands contributed each with a track to “Tomb Of Ordeals”, which can’t be seen as an ‘ordinary’ compilation, but rather a conceptual release featuring eight projects focused on one central theme. “Tomb Of Empires”, “Tomb Of Seers”, “Tomb Of Druids” and the new one “Tomb Of Ordeals” are now also available as CD-box. Artists: Oljus, Dronny Darko, Ajna, Asath Reon, Plamen Večnosti, Apocryphos, Cut The Night, Enmarta. 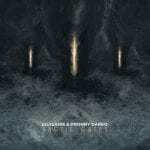 Content: The common element between all the projects remains the fascination for dark-ambient and dark-cinematographic music. I also noticed a few ritual passages. There’s an interesting diversity between the artists, revealing some early-like industrial/ambient elements (like the track by Dronny Darko) and more contemporary passages. + + + : This fourth volume of the “Tomb”-series also is my favorite.. Some artists such as Dronny Darko, Apocryphos and Cut The Light have composed impressive work. Dronny Darko’s “Geist” reminds me of the early 80s dark-ambient work of Lustmord. From the very first monstrous sound of the track you feel like a paranoid sensation. This track has such a strong visual appeal it simply sounds like an ode to some pioneers in the genre. The progression of the track composed by Apochryphos is another moment of magic while Cut The Light deals with overwhelming sound treatments. I also have to mention noticeable contributions from Oljus and Ajna. – – – : I don’t see real minus points to mention. 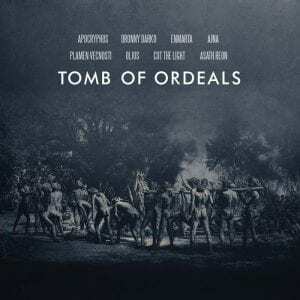 Conclusion: “Tomb Of Ordeals” is a frightening title for a great work. Cryo Chamber likes this kind of conceptual- and collaboration releases, but this one is according to me the most accomplished one from the list. Best bands: Dronny Darko, Apocryphos, Cut The Light.